Howdy friends, Layle back with you again today for Day 2 of our Spring 2014 Reveal Week! If you missed us yesterday, you can catch the reveal of our brand new summer collection, Good Day Sunshine, here. Be sure to check back with us each day this week for more new goodies as well as a chance to win our new products before you can buy them! You can also follow us on Instagram at simplestories_ for additional chances to win! Today I'm excited to introduce you to the 2nd of our new Spring Release collections - The Story of Us. Capture your own love story with The Story of Us. Glittery golds, shimmery silvers and bold blacks bring your one-of-a-kind love story to life. So there you have it - The Story of Us! We'd love it if we could show each and every one of you this amazing new collection in person. But since we can't do that, we've done the next best thing - we've set up part of our tradeshow booth in our offices and shot a short video to show you The Story of Us - almost as if you were there in person; so take a peek at The Story of Us as I walk you through the collection! Make sure you head back here when you're done to see a few fun projects created by our talented design team as well as to enter for a chance to WIN The Story of Us before you can buy it! Now that you've seen all of the beautiful The Story of Us products, how about a few projects to whet your appetite before The Story of Us starts shipping mid May? The Story of Us begins shipping to retailers mid May, so it won't be long before you can get your hot little hands on it! How about a chance to win a The Story of Us prize pack before you can buy it?!! You have 2 chances to win! Second - PIN TO WIN! Just pin your favorite(s) of the The Story of Us images in this post, tag your pin with #simplestories and #thestoryofus, then leave us a comment on this blog post telling us that we've been pinned and include your Pinterest user name. That's 2 chances to win a The Story of Us goodie box before you can buy it! And because we're feeling extra generous, how about a 3rd chance?! Remember when I suggested you follow us on Instagram waaaaaay back at the beginning of this post? I'll be doing random giveaways on Instagram as well throughout the week, so follow us at simplestories_ for a 3rd chance to win! I'll announce all of the winners throughout the week in one giant celebratory post here on Sunday the 10th, so make sure to check back then to see if you're one of the lucky winners! Good luck - we can't wait to hear what you think about The Story of Us! And remember, today is only Day 2 of FOUR fun filled days, so meet me back here tomorrow morning for Day 3! I'm so excited to kick off our Spring 2014 Release Reveal Week. We've been busy, busy, busy working on some amazing new products to share with you - this is our biggest Spring release yet - and now's the time when we can finally share! Even better news - the collections you see here on the blog this week will be shipping to retailers mid May, so they'll be here before you know it! Today is the first of four full days! of our reveal week, so be sure to check back each day for more goodies as well as a chance to win our new products before you can buy them! You can also follow us on Instagram at simplestories_ for additional chances to win! Today we introduce you to Good Day Sunshine. Say hello to summer! Full of the happiest of colors and just the right touch of vintage whimsy, Good Day Sunshine is everything you need to highlight your sunny day memories. So there you have it - Good Day Sunshine! We'd love it if we could show each and every one of you this amazing new collection in person. But since we can't do that, we've done the next best thing - we've set up part of our tradeshow booth in our offices and shot a short video to show you Good Day Sunshine - almost as if you were there in person; so take a peek at Good Day Sunshine as I walk you through the collection! Make sure you head back here when you're done to see a few fun projects created by our talented design team as well as to enter for a chance to WIN Good Day Sunshine before you can buy it! Now that you've seen all of the beautiful Good Day Sunshine products, how about a few projects to whet your appetite before Good Day Sunshine starts shipping mid May? Good Day Sunshine begins shipping to retailers mid May, so it won't be long before you can get your hot little hands on it! How about a chance to win a Good Day Sunshine prize pack before you can buy it?!! You have 2 chances to win! Second - PIN TO WIN! Just pin your favorite(s) of the Good Day Sunshine images in this post, tag your pin with #simplestories and #Good Day Sunshine, then leave us a comment on this blog post telling us that we've been pinned and include your Pinterest user name. That's 2 chances to win a Good Day Sunshine goodie box before you can buy it! And because we're feeling extra generous, how about a 3rd chance?! Remember when I suggested you follow us on Instagram waaaaaay back at the beginning of this post? I'll be doing random giveaways on Instagram as well throughout the week, so follow us at simplestories_ for a 3rd chance to win! Good luck - we can't wait to hear what you think about Good Day Sunshine! And remember, today is only Day 1 of FOUR fun filled days, so meet me back here tomorrow morning for Day 2! Spring 2014 Release Sneak Peek! It's an exciting day - here's a little sneak peek of our Spring 2014 release – our largest spring release yet! Stay tuned here on the blog for the full reveal, beginning tomorrow, the 29th! So tell me - what are you most excited about seeing tomorrow?! Spring 2014 Sneak Peek & National Scrapbook Day Celebration! Join us here on the blog as well as on Facebook, Instagram and Twitter tomorrow as we kick off a FABULOUS week long celebration, starting with the reveal of our biggest Spring Release ever and ending with a National Scrapbook Day celebration on Saturday. We hope you'll join us! We have two lucky winners to announce today! Congrats ladies! Please send an email to layle@simplestories.com and I'll follow up with details. Hello, everyone! Melissa here with you today to share a Life Documented layout using Simple Stories' DIY and DIY Boutique collections. I had a little help designing this page thanks to a fabulous sketch by Becky Fleck of PageMaps. Becky put together lots of great sketches last month with inspiration for using Simple Stories' Pocket Pages, and this particular one centers around Simple Stories' Pocket Page Design 3. I didn't have many photos for this particular week in my album, so I was glad to have some extra inspiration to fill those empty pockets! Using a combination of the embellishment cues from the sketch and the layering elements from DIY and DIY Boutique, I was able to quickly build a few decorative clusters to fill in the blank space. DIY Boutique has a great combination of neutral bases in kraft, cream, white, and black, and I used them liberally to keep the bright colors from the title words, shape stickers, and enamel dots from overwhelming my page. How about a little incentive to head on over and check out these and our other fun designs here at the Silhouette Online Store?!! Head on over, take a peek at all of our designs, then hop back here and leave a comment on this post telling us which design is your favorite. 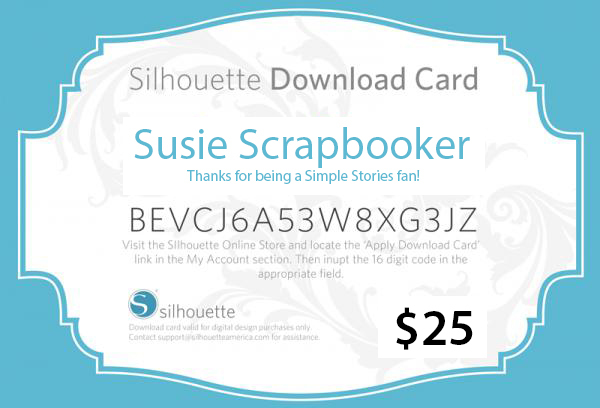 On Sunnday the 27th, we'll draw one random lucky winner to win a $25 Download Card to the Silhouette Online Store! Hey there! It's Vicki here today with some DIY goodness to share. For CHA Winter I had lots of fun creating a series of make 'n takes using pieces of the DIY line. Let me tell you…I am head over heels for DIY!! I love to layer and build projects and this line was made for exactly that! Take a look at some of the pieces I had to work with and let me tell you a little more about it. I could create these DIY projects ALL DAY LONG!!! They are versatile and fun. This system works for any type of crafter…cardmakers, scrapbookers, pocket page lovers, etc. The possibilities seem endless. I plan on making more with a few different elements and additions and I will post them when it's my turn again to spend some time with you here. Thanks for stopping by! I can't wait to hear your thoughts on DIY and see what you create with it! !